A backyard deck can add value to any home by providing functional outdoor space that adds to the square footage of usable living area. And when it comes to constructing your deck, you can't go wrong with wood. Wooden decks are considerably less expensive to install than their composite counterparts. Because you can stain wood to any color and shade, it’s easy to create a look that is compatible with the rest of your landscaping, making wood an affordable and beautiful option. If you want the sturdiest and most beautiful deck, have yours constructed with wood. 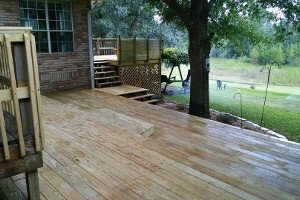 And for the best wooden deck, have yours provided by the experienced contractors at All American Industries. If you decide to sell your home, you want to get as much value out of it as possible. And a deck is a great way to add value to your home, thanks to its above-mentioned feature of providing usable space to your property. And since wooden decks are affordable relative to other kinds of decks, you can enjoy that increased value to the fullest since you won't have to spend a fortune on installation. If you want to increase your property, call us for a quality deck construction and installation. If you endure the expense of having a deck installed, you'll want that deck to stand beautiful and strong for many years to come. And with a deck constructed from good, solid wood, you can bet on enjoying your deck for many years to come. Wood is naturally durable. And once treated, coated, and protected against the elements, your wooden deck will remain looking like brand new for many more years to come. When it comes to durability, you can't beat wood for your deck construction. And when it comes to the best-quality wood and deck construction, you can't beat All American Industries. If you're ready to have a bit of paradise installed right in your own backyard, call All American Industries for a new deck. Our decks are of the highest quality while still maintaining a reasonable cost to you, so let us handle all of your decking needs!